Dubai property developer Deyaar on Sunday reported a 47 percent rise in second-quarter net profit as it gained from lower costs and fair-value adjustments of prices for its investment properties. 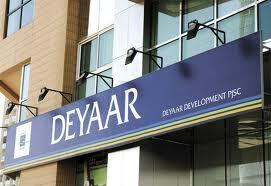 Deyaar, one of the companies worst hit by Dubai’s real estate market collapse in 2009-2010, posted a consolidated net profit of 27.3 million dirhams ($7.4 million) compared with 18.6 million dirhams in the corresponding period of 2012. One analyst at SICO Bahrain had forecast a second-quarter profit of 6 million dirhams. Revenue for the quarter dropped to 93.6 million dirhams from 143.5 million dirhams in the prior-year period. The developer made a gain of 36.6 million dirhams in the quarter from fair-value adjustments for its investment properties. Direct costs for the quarter fell to 2.2 million dirhams from 82.9 million dirhams.